Today’s retailers are very focused on improving the customer experience, but their efforts are hampered by time-consuming manual tasks such as topping up cash drawers, delivering change to checkouts and doing back office cash counts. APG Cash Drawer, a fast-growing global manufacturer of cash management solutions, announced today a study conducted in partnership with IHL Group showing that retailers can recoup an average of 200 to 500 of labor hours per store monthly by replacing manual cash management with automation technology. 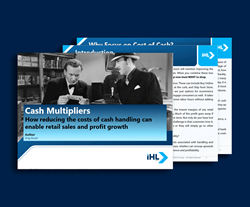 The study, “Cash Multipliers: How Reducing Cash Handling Can Enable Retail Sales and Profit Growth,” disproves the notion cash-based transactions are waning. In fact, cash accounted for 41.2 billion transactions in 2017 through 12.1 million cash points such as wallets, cash drawers, ECRs, POS stations and mobile POS lines. These transactions incur costs to retailers from 4% to 15%, depending on the retail segment, and up to 71% of those costs are related to front-of-the-store activities such replenishing change at tills and closing out drawers at the end of a shift. Depending on the vertical and cash handling procedure, with integrated cash management solutions, businesses can save 15-30 minutes per day, per POS on cash counts which can be redeployed to profit generating activities and an improved customer experience. Retailers have an urgent need to cut their cash-handling costs not only because cash purchases account for almost one third (30%) of all transactions but also because they must find ways to compete with market leaders Walmart and Amazon. The study found retailers don’t know their true costs of managing cash because the process involves multiple components and operating units, making it difficult to keep track of all associated tasks. Costs include tasks at the local store such as drawer starts, rebuilds and closings, transporting cash to banks, and bank fees. Adding to the challenge is that higher-paid senior employees and managers are the ones involved in cash management. To reduce costs, retailers can take advantage of automated solutions such as the SMARTtill® Cash Management Solution, smart safes, cash recycling solutions at checkout lanes and automated cash management systems. Retailers can reduce their cash-related expenses anywhere from 15% to 80%. “We’ve known for a while that cash-handling costs are a major challenge for retailers of all shapes and sizes, and this study confirms the costs are indeed substantial. Thankfully, retailers have options for bringing those costs under control, and automated solutions are the answer,” said Mark Olson, President and CEO of APG Cash Drawer. “Today’s retailers are very focused on improving the customer experience, but their efforts are hampered by time-consuming manual tasks such as topping up cash drawers, delivering change to checkouts and doing back office cash counts. Staff time that should be dedicated to the customer experience is, instead, spent on these tasks. That’s why it’s critical to bring down cash-handling costs,” said Greg Buzek, President at IHL Group. Retailers are encouraged to visit APG at NRF 2018 (booth #2669) to receive the full printed cost of cash report and to demo APG’s SMARTtill Cash Management Solution, a revolutionary new technology that reduces time spent on counting and reconciling tills in lanes and in the back office of retail stores. Now with TCP/IP technology for intelligent cash management applications capability, the SMARTtill Solution will help retailers leverage mPOS systems and cloud based applications creating a modern, flexible shopping environment for their cash paying customers in convenience stores, grocery stores, small boutiques, fast food, quick service restaurants, and gas stations At NRF, APG’s SMARTtill Solution integration partners include Balance Innovations (VeriBalance), Gulfcoast Software (Storekeeper), Numus (Transtrack), Site Lantern and TGCS France (Storemate POS Platform). Schedule a meeting with us at NRF 2018 to see the latest innovations in cash management technology and to receive your copy of the IHL Cash Multipliers report.